Can you decode the message? In 10 years, I have given out zero gift cards….so good luck. More info on this challenge below. A trip today to the Franklin Institute science museum in philadelphia reminded me some of cryptography nuggets you can use in math class; in particular, discussion starters for inverses, and code-breaking using matrices. 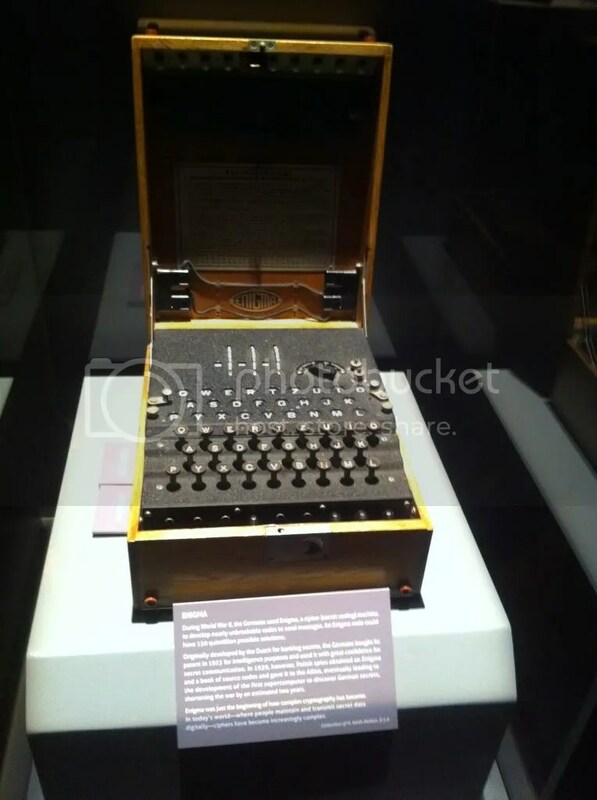 One of the first artifacts we encountered in the exhibit was the Enigma machine shown below, which I fawned over like a teenage girl at a One Direction concert. The Engima machine is a coding machine, used primarily during World War II, to both code and decode messages. Messages were typed using a standard keyboard. The electric signals from the keyboard passed through a system of rotors and plugs, and lit up a letter, which was recorded. There were a number of variations of the machine over the war years, and the Allied forces employed many mathematicians, many working through Blechtley Park in London, to intrcept and de-code messages. How would you even start to decode this message? Does a one-to-one correspondance seem reasonable? How else can letters be coded? You can try your hand with some coding using this Enigma Simulator, which shows the coding rotors, inputs and outputs. But here’s the neat thing about the Enigma machine: the machine is used to both code AND decode messages, using similar procedures, which are outlind here. So, now you have everything you need to decode my message it seems. You have a message, and a device. Oh, but those pesky rotors. If they aren’t set correctly, then the machine is of little help. Working through this issue was the task of many of the mathematicians during WWII. And I want you to be successful! Set those pesky rotors to R-J-L (my initials), and start typing! You can also copy and paste the message, but it is far more fun to watch the rotors do their work as you type. After looking at some messages and their coded outputs, is there a ONE-TO-ONE correspondance here? For example, does the letter E in a coded message always map to the same decoded output letter? Are there any patterns we can use to help decode the message? Any predictable behavior? 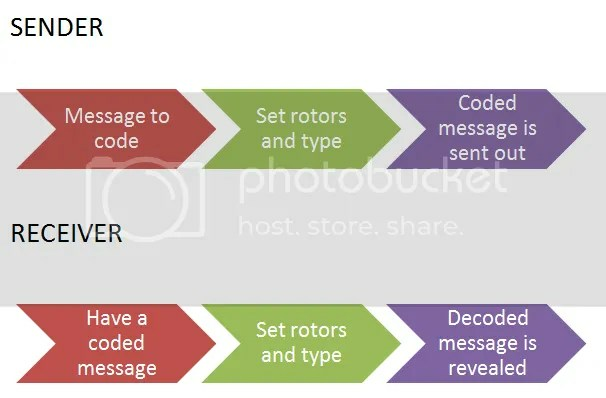 A message is coded using a rotor setting. Then this coded message is typed, using the same rotor settings, and we get back the original message. The Enigma machine is its own INVERSE! How exciting is that! How many ideas or devices do we know of which are their own inverse? Exploring the Enigma, from +Plus Magazine. Good student reading, with guiding questions. This Numberphile Video has a demonstrations of the gears and plugboard of the Enigma, and some explanation of combinations. In my next post, we’ll look at Hill’s Cipher, a cryptography application of matrices, and think about my Best Buy challenge!